The Z-11 MIDI Switcher by Engl was designed for accessing specific switchable functions of amps via MIDI that are switched via conventional 1/4" jack/plug-compatible footswitches. Settings are saved to 100 MIDI program locations. You also have the option of selective access via 8 poly channels or comprehensive transmission of MIDI program change commands 0 to 100 via Omni mode. 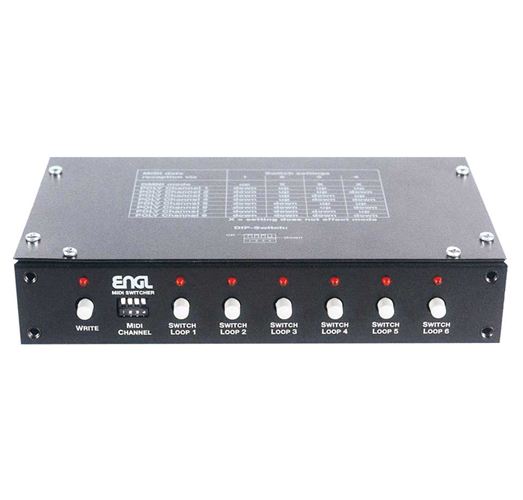 The Engl MIDI Switcher is equipped with 6 switching loops, whereby 4 circuits are accessible via two 1/4" mono jacks. This makes it much easier to connect devices equipped with 1/4" stereo jacks for use with dual footswitches. When it is used in conjunction with the Engl MIDI Footcontroller Z-12, the power for the footcontroller is routed from the MIDI Switcher via the MIDI cable. Easy to operate and offers loads of comfortable handling options.